Marc Jacobs' first 'real' smartwatch is coming this summer. The Marc Jacobs Riley Touchscreen follows the styling of the Riley hybrid smartwatch we saw last fall. It runs Wear OS, for alerts, messages, apps and Google Assistant voice controls, and will come in three styles: polished gold-tone case with a white silicone strap, rose gold-tone case with a grey silicone strap and black, ion plated case with a black silicone strap. We haven't seen the Riley smartwatch in person yet but from the press pics it looks simple and stylish with a fun, rounded crown/pusher. The customisable watch faces - some nice and retro - look good too and can be matched to your mood, outfit or event with over 1,000 combinations. One thing we can see is that, like other Fossil Group designer watches such as the Skagen Falster and Kate Spade New York Scallop, there's a thin black bezel between the watch face and the casing. Otherwise, MJ is being a bit short on specs - we don't know the size of the watch or screen, the resolution, thickness or weight yet though Marc Jacobs does say it is "lightweight". What we do know is that the Riley Touchscreen will run on Qualcomm's new Snapdragon Wear 2100 platform and have a 24 hour battery life with a magnetic wireless charger. 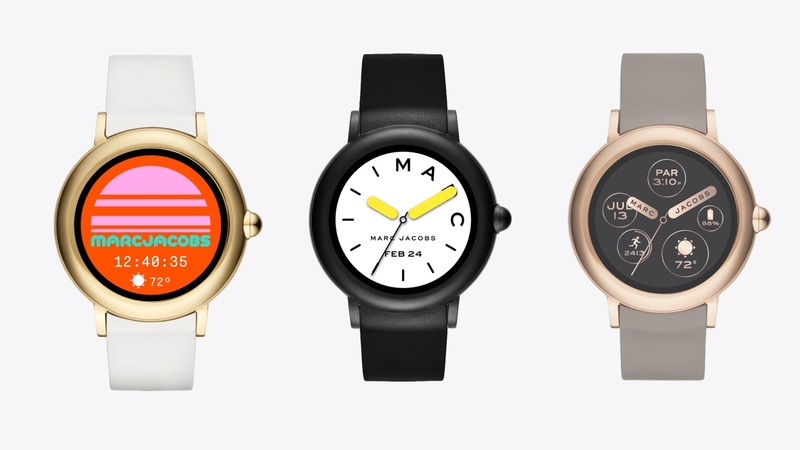 The Marc Jacobs Riley Touchscreen Smartwatch is set to go on sale via ASOS in July for $295.